Visit Scotland will present the new Biggar and Upper Clydesdale Museum with its five-star attraction award today, at 1.30pm. 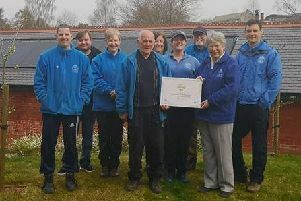 The top-notch recognition came within weeks of the museum opening on the former garage site on Biggar High Street last year. Biggar Museums Trust, a local charity, managed to raise a total of £2.2 million to buy the derelict garage and turn it into a state-of-the-art museum, to replace its former museums at Moat Park and Gladstone Court museums. Displays cover millions of years, from the geology and the archaeology of the area, through the Covenanters and the Fleming Family’s links with Mary Queen of Scots, to the alleyway of restored Victorian shops, right up to the Polish soldiers billeted in the area in wartime, and the former telephone exchange, with many interactive displays and eerie sound effects. The museum opened to the public in July, and was declared open officially by the Princess Royal in October - and by that time Visit Scotland had ranked it one of the top attractions in the country. Now the award will be presented formally this afternoon.